Cool linen titillates the senses. The ideal wedding present. Are your best friends moving in together? Is your son or daughter getting married? 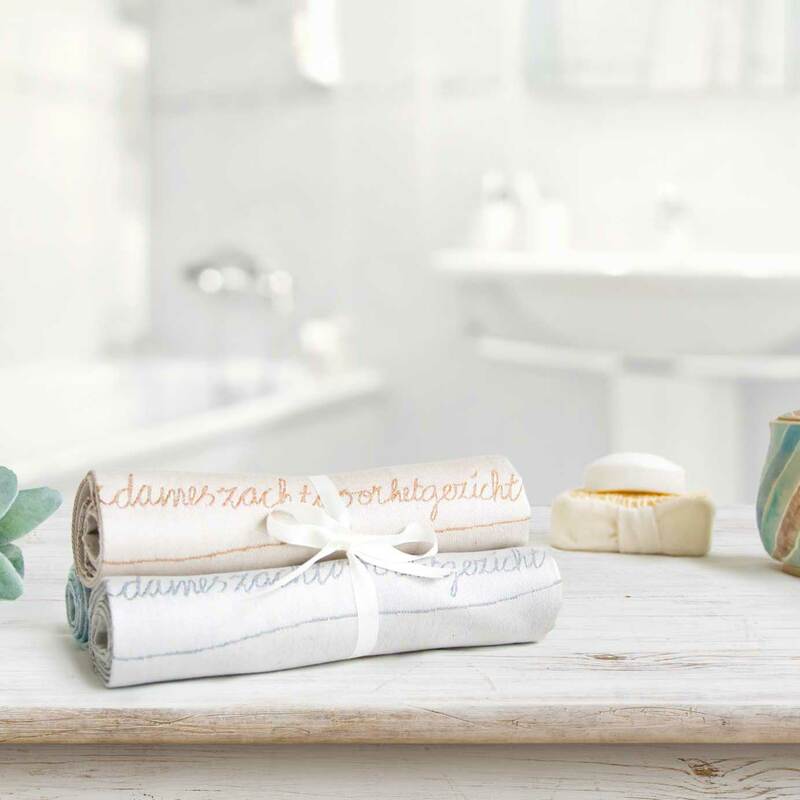 Why not give a mini linen set as a present: six cheerful household cloths packaged in a heart-warming gift box with a fun, informative brochure. All the cloths are woven in linen (the weft) and cotton (the warp). 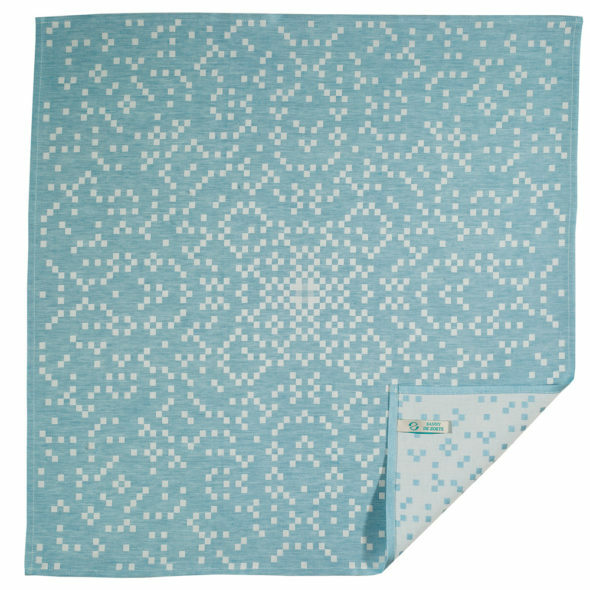 The cloths are available in turquoise, silver grey and taupe and are a generous size: 65 x 65 cm, and 50 x 50 cm for the thigh cloth. 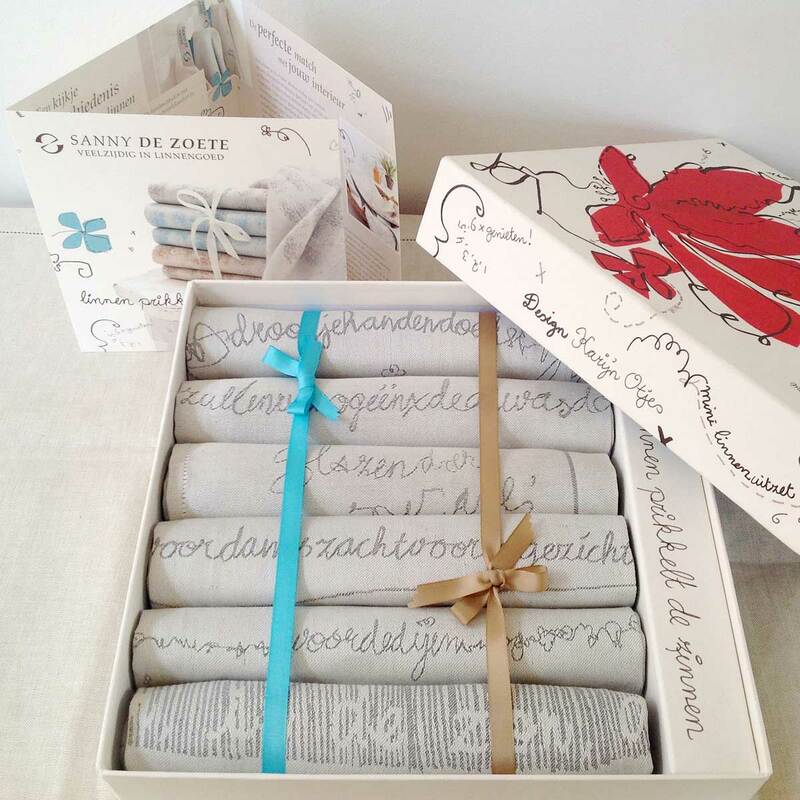 The mini linen set complete with box and brochure:  € 105.00. The cloths can also be bought separately at € 17.50 each. What a beautiful, modern and attractive design, thinks everyone who looks at this pattern. They look like random squares, but they are not at all. Each little square represents a prime number. Primes? Oh yes, that are numbers only divisible by 1 and themselves. Balthasar van der Pol, a famous Dutch mathematician-physicist-engineer, designed this pattern showing the Gaussian primes in 1945. Linen and Damask Manufacturer E.J.F. van Dissel in Eindhoven produced the cloths till they closed down in 1972. Now again taken in production by Sanny de Zoete. If you would like to know more about the history of this unique cloth, click here. The prime cloths are woven in pure linen (warp) with pure cotton (weft). They are available in turquoise, taupe and graphite. You will love the big size; 65 x 65 cm (26 x 26 inch). 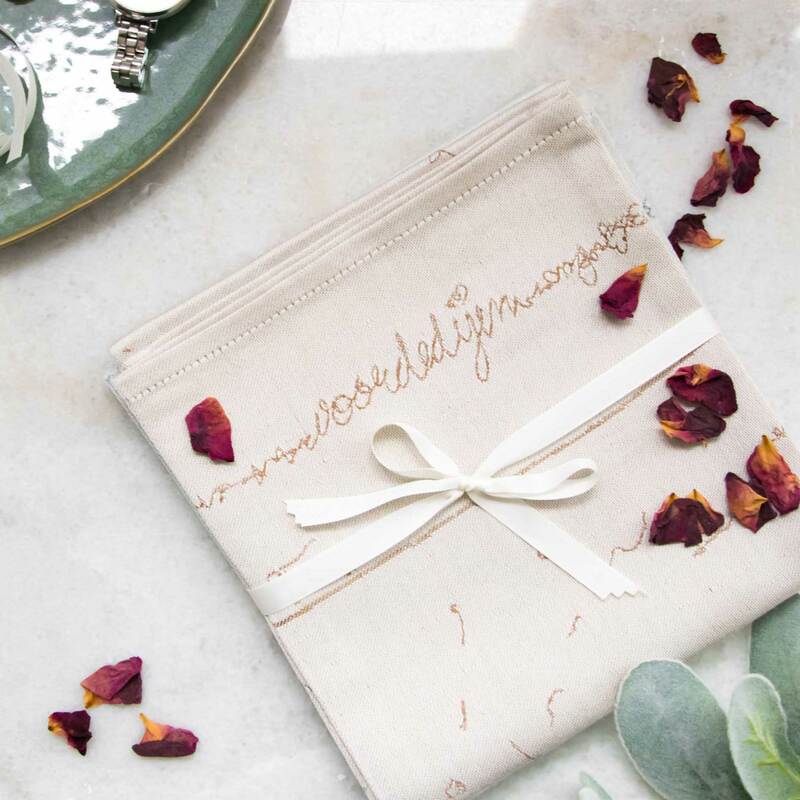 They are multifunctional: you can use them as a napkin, small table cloth, towel or tea towel. Framed on the wall? Gorgeous. We even made covers from the cloth (with underlayer on the inisde) for our laptop, iPad and iPhone. Isn’t that also a marvellous idea? The cloth is € 27,50 per piece, including world wide shipping costs! Sleep just once under pure linen sheets and you will never want to use anything else! 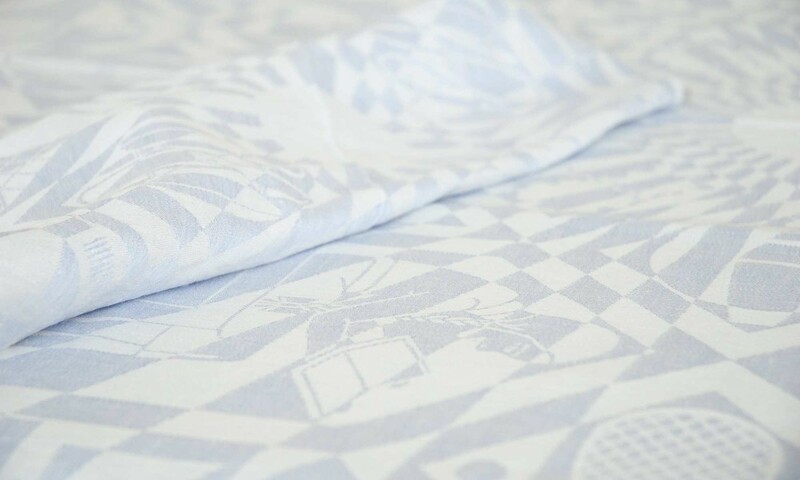 Borrow a set of bed linen free of charge to sleep under for a few weeks, and if you like it, we will order a set for you made to fit your bed. 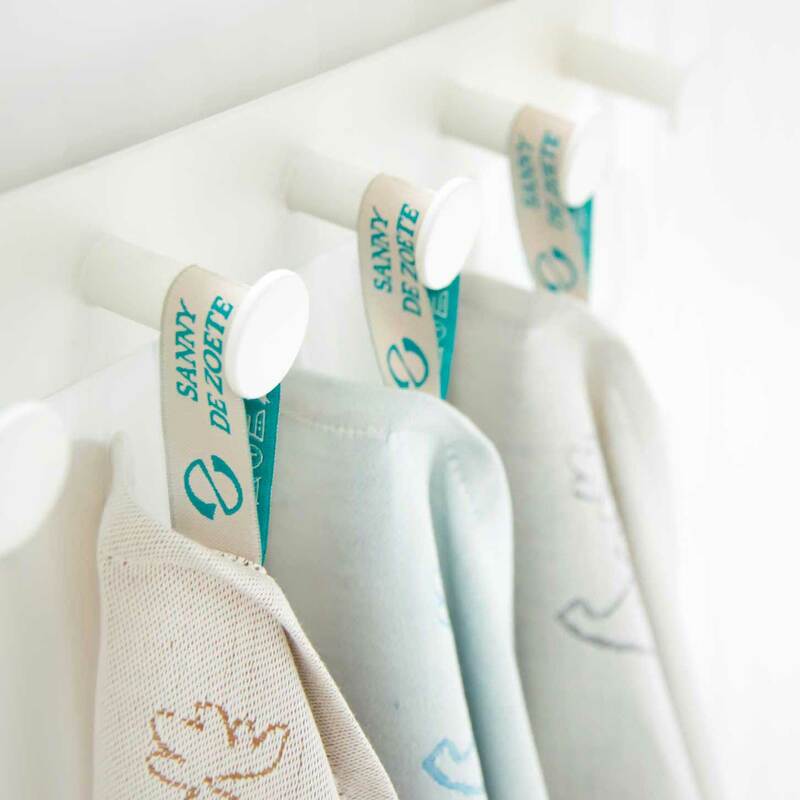 We have fine, white, Irish linen for those who like smooth linen, or for the modern family we have coloured Belgian linen: in the wash and dryer and it’s ready to go. The creases give the linen a contemporary touch. 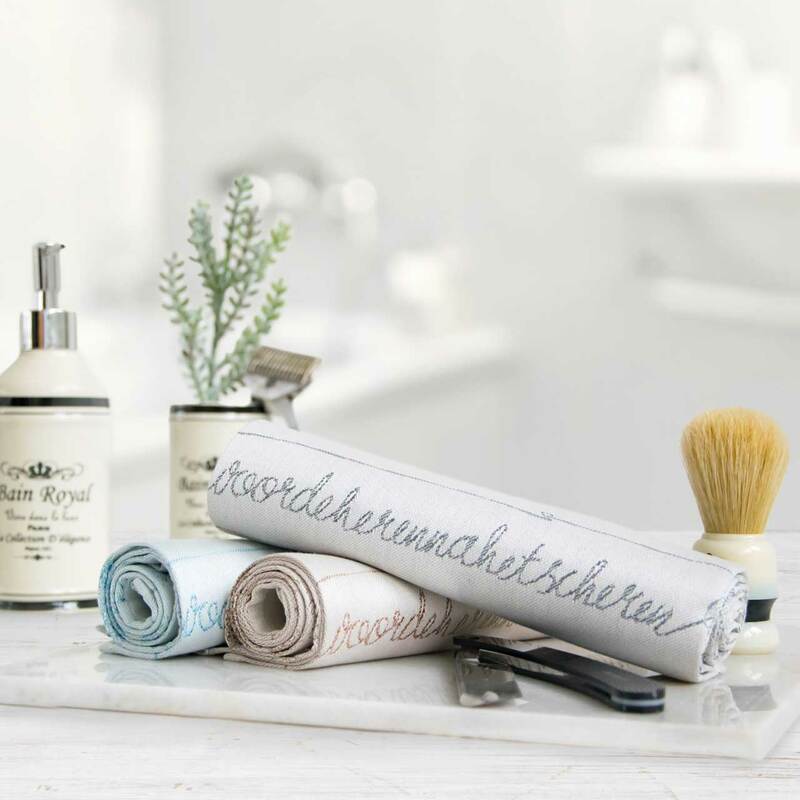 The Irish linen is made-to-measure: we have linen bed sheets, linen fitted sheets, linen duvet covers and linen pillowcases, all finished with a beautiful hemstitch. 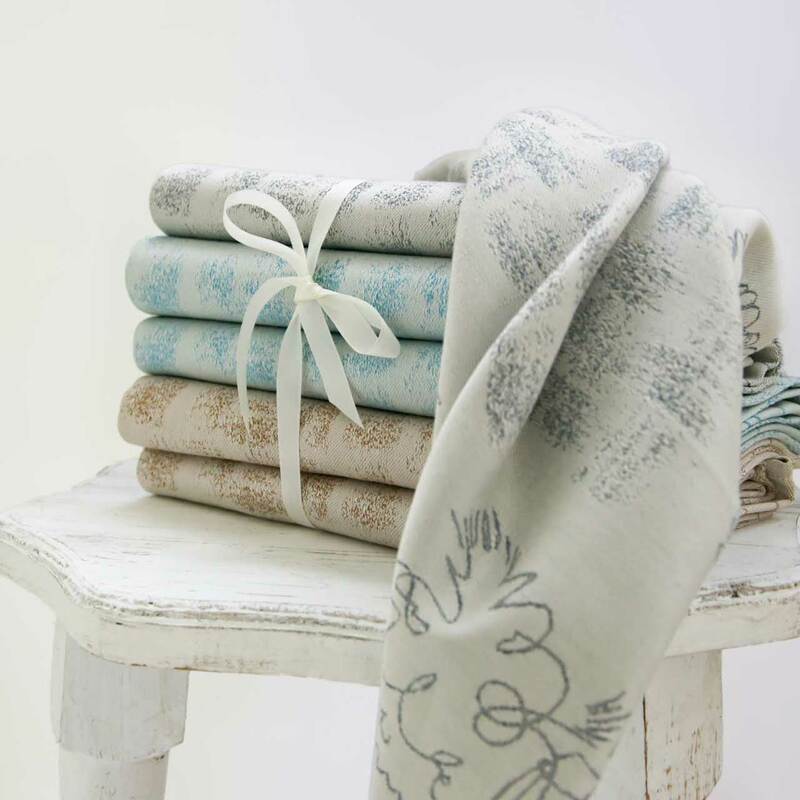 The Belgian linen is available in standard sizes but can also be made to order and comes in 11 harmonious colours. The light never shines as beautifully as it does through linen curtains. Make opening your linen curtains a joyful start to every day. Both the curtains and net curtains are available in different colours and finishes, from very fine to a coarser structure that shows off the irregular, natural structure of the linen perfectly. We work together with a first class curtain maker who sees the unusual properties of linen not as a problem, but as a challenge. Why not borrow our sample book for a weekend to choose the right colour for your home?